The recent trip to The Netherlands and sitting in the awful stop start traffic of the Antwerp ring road inspired me to finally resolve a clutch issue that I knew I had with Gertie. For a long time there has been excessive play when the clutch hasn't been engaged and when it is engaged the piston is almost coming out the end of the slave cylinder. I suspected that the taper pin that holds the clutch fork onto the cross shaft inside the bell housing was broken and this was causing my problem. Although if it was this, then I'm amazed that the clutch would still function properly at all. After various other investigations proved fruitless evidence was still pointing towards the taper pin and after a few days of pondering I decided to take the plunge and remove the gearbox. In a way I was quite relieved as this meant that removing the gearbox hadn't been a waste of time. Removing the cross shaft from the clutch fork took some time and effort, so there must have just been enough of the pin sticking out of the cross shaft to still operate the clutch. Once removed new cross shaft bearings were fitted and the new taper pin installed. I also fitted a new clutch release bearing as the old one had become a bit 'chatty'. 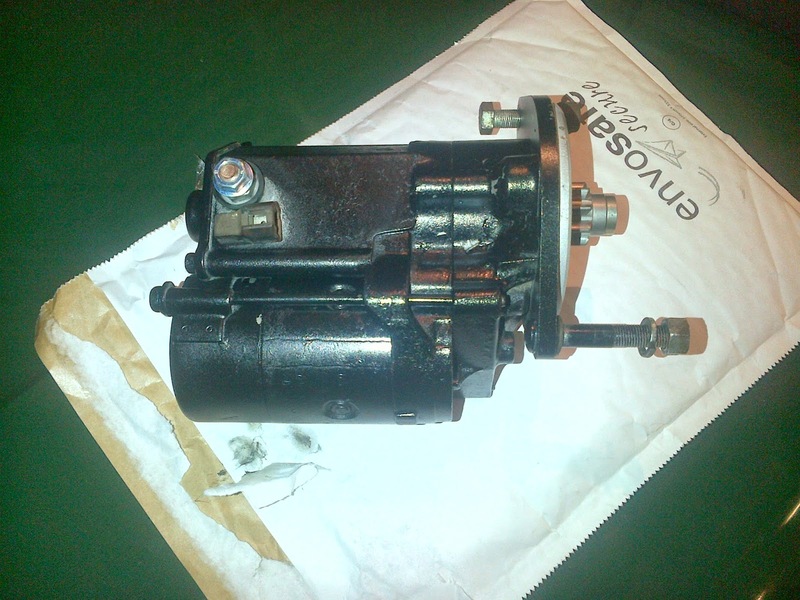 With the gearbox back in and all bolted up I then had to wait for the return of my reconditioned starter motor a few days later. The starter motor was the collected from Danbury auto electrics and fitted that night and a very short test drive proved that the clutch is now nice and smooth with no nasty 'clicky' noises or 'notchy' movements. So all seems good. Looks like we are back on schedule for the HCR after all! Happy Days! A brief stop on the way to Dover had us in a mild panic as Gertie refused to restart. After persuading the starter motor to rejoin the land of the living with the aid of a small hammer, Gertie fired up and we were once again on our way. Halfway across the channel the sun decided to join us as well and a very nice drive through France and Belgium followed. This was my third year of competing in the Chinese Rally and the weather had never been so good. It snowed last year and rained the year before that so the sunshine was absolute bliss. The traffic on the ring road at Antwerp was horrendous and over an hour later we finally made the exit we wanted towards Eindhoven. A brief stop in the services saw us topped up with Coffee & Cheese biscuits and we then carried on into the Netherlands and to our hotel at Haaksbergen. By the time we arrived it was 9.45pm and the restaurant was closed but the friendly lady in charge cooked us two pizzas anyway. This was washed down nicely with a few beers and made for a nice end to a long day. Saturday morning was spent mooching around the local town which again was very beautiful in the sunshine. We then decided to check out the start location for the rally later that evening and fill up with petrol in case there were no garages on route. Back at the hotel we were joined in the afternoon by Andy Flaxney & Jeremy Lupton, Mike & Gillian Helm, Mike & Jane Charlton and Mike Bishop and Darren Armitage. We were also joined a bit later by Theo, Roger, and Willi and Jennie Mindak. 4pm soon arrived and we headed for the start point at the Kings Wok in Beckum where we enjoyed a lovely Chinese meal. Our departure times arrived and before you knew it we were off into the wilds and following the tulip diagrams in the road book and trying our best to keep to the proposed route. Ten pages of diagrams later we were joining the other drivers at the halfway stage for coffee & cake. Once suitably refreshed we set off again into the night for the second half of the event. There were some great roads and some real nice cars as well. The British Triumphs all finished although Andy Flexney's car did have some electrical issues. More beers in the bar finished the night nicely and we turned in in readiness for the long trip home. Sunday morning dawned bright and sunny again and after a good breakfast we all bid our farewells and took to the road. Large thermometers by the side of the motorways showed a gorgeous 16 degrees and I couldn’t remember the last time I drove Gertie with the windows open. Roll on the summer! We arrived in Dunkerque in plenty of time for our Ferry, but then Gertie blotted her copy book again by refusing to start when being called for embarkation. The ignition lights came on but then nothing when the key was turned. Luckily the people behind us very kindly gave us a push start and we made the ferry back to blighty. Just over two hours later we embarked at Dover and promptly drove straight into a traffic jam on the M2. I was diverting off at the Sheerness turn off anyway as I had won a Triumph Stag Petrol tank (For my MK2 estate-they’re the same) on ebay while we were away and had arranged to collect it on the way home. With the tank collected we headed back to the M2 only to find it still busy! Two hours later we arrived home quite exhausted from our long, but fantastic weekend away. I do like these weekends away in Holland and will most probably book the next one in November. However, the main focus for now is sorting out Gertie’s starter motor issues in time for the HCR in a few weeks time. Actually, since returning home another issue has come to light and at present Gertie’s gearbox is sitting on my workbench! Will it be cured and refitted in time for the HCR? Who knows? Watch this space! The fuel problem that has dogged me for so many years with this car has made an unwelcome return after 15 months of absence. I thought that whatever it was that clogged the fuel line up every now and then had finally gone into retirement when suddenly on Thursday 6th March 2014 it viciously returned. To add insult to injury the car had just passed its Mot and was on the way home. As usual, it decided to break down on a busy dual carriageway with no lay-by’s or emergency breakdown areas, or street lamps. So I know it wants to kill me. 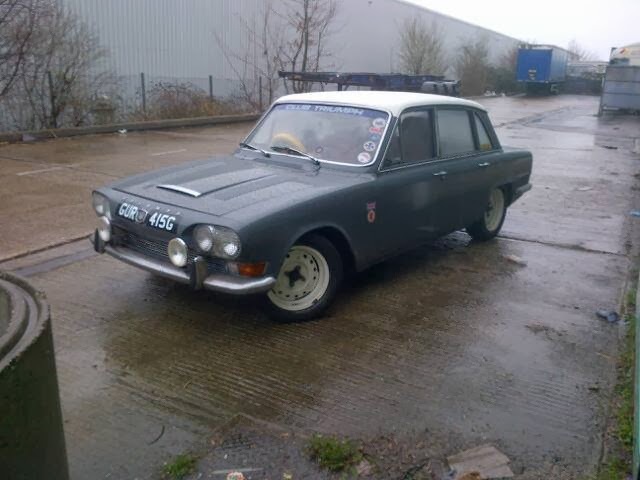 Now that Gertie is minus its gearbox, this is the car that may have to be used for the HCR god forbid! I wonder if we’ll get a special prize for breaking down in every county? Due to other commitments (Details to be revealed soon) I've not really had the time to do anything much car related recently hence the blog being quite.... erm.....quiet. I've managed to fit in a couple of local rallies which resulted in finishing in 2nd from last place both times, so not a good start to the year. After a long day at work, a long drive up to Ardleigh in Suffolk followed where the rally was to start from. The rain still hadn't stopped and you couldn't help feeling that you'd have been better off with a boat! With our start time due we were handed the clues and Ellis set about plotting. The CMC rallies are timed events and very strictly adhere to as well. It was Ellis's first CMC timed event so we were entered in the 'beginners' class. This class allows you fifteen minutes to plot as much of the route as you can before your 'departure' time. However, given the length of the route, you really don't get much plotting done. eight long sections on the agenda along with rain, mud, potholes, puddles and some fords thrown in just for good measure. Our departure time from TC0 (Time control zero) was 20.01 and we finally arrived back at the last time control at 10.55. Probably one of the longest CMC night rallies I've ever done. The results were announced and we had come 1st in class and 6th overall. A good night and a good result too. Ellis even enjoyed himself and has vowed to do more in the future. Gertie performed well and caused us no problems, which is just as well as she is off to Holland next weekend for the Club Triumph Holland 'Chinese Rally'.